Basically, if it’s paper, we can shred it! All types of paper documents generated at home or in the office are suitable to send to the shredder. Good news: there’ no need to go through your documents and remove any clips or stables. Any good quality shredding machine is able to slice right through these as most are made from soft metals. Foolscap folder, like manila folders, aren’t usually an issue if they have small metal bindings. That means you don’t have to spend valuable time emptying the contents of a file! It’s best to avoid sending any cardboard to the shredder unless absolutely necessary. For boxes, lever arch files and other cardboard items are ideally emptied of contents to be shred, then compressed into separate bales and sent to for recycling. When it comes to cardboard, the line is a little fuzzy so it’s best to check with your local document destruction company to see how they process it. 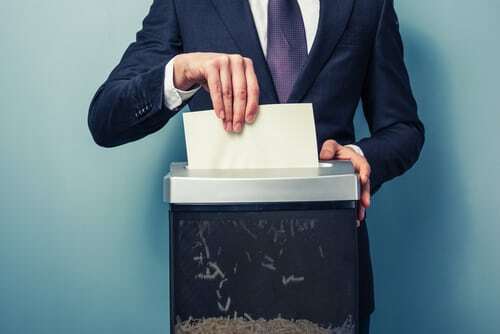 Small plastic bindings will pass through the shredder, but most companies can’t have too much plastic content in the bales as paper mills will reject them. Plastic folders are similar to cardboard in that they will need to be emptied and the plastic itself is disposed of separately. Again, it’s best to check with your local document destruction company to double check. Some high-powered shredders will accept materials like this, though that is an anomaly. Any good document destruction company will take care of the sorting for you. Good quality, clean paper is sorted and shredded separately so it can be recycled and used for products such as office paper. Lower grade, heavily printed or coloured paper is often shredded and bailed separately to be recycled into household products such as toilet paper. The perk of hiring a professional shredding company is that you don’t have to do this yourself! You can simply enjoy the peace of mind knowing your paper waste is being recycled and you’ve done your bit for the environment. If you’re located in Melbourne, In Confidence is the best choice for easy, fast and secure document destruction. We can arrange lockable containers that we drop off and pick up for shredding. Our team takes your personal and company security seriously, so you’ll receive a certificate of destruction on completion of the job to give you the extra confidence you’ve been looking for. To discuss your document destruction needs, give In Confidence a call on 1300 723 187.